Forbidden Archaeology -  An epic journey of new discovery so fantastic that our natural instinct would be to block it out. California and discussed in his book, Forbidden Archeology, Cremo argues for the existence of modern man on Earth as long ago as 30 to 40 million years ago. 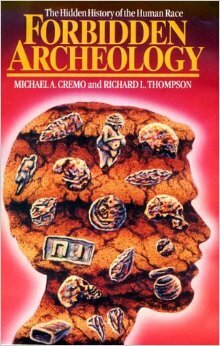 Forbidden Archeology, which he wrote with Richard L. Thompson, has attracted attention from mainstream scholars who have critiqued the views given on archeology and consider it pseudoscientific. Over the past two centuries archeologists and anthropologists have ignored, forgotten and suppressed vast quantities of evidence showing that human beings like ourselves have existed on this planet for tens of millions of years. Forbidden Archeology documents a systematic process of "knowledge filtration" and constitutes a serious challenge to the Darwinian theory of evolution. Order Michael Cremo’s Revolutionary work! A Vedic Alternative to Darwin’s Theory and Forbidden Archeology’s Impact from our Open Revolt store. In their 1993, 900-page tome, Forbidden Archeology and its condensed version, Hidden History of the Human Race, co-authors Michael Cremo and Richard Thompson brought forth largely unknown evidence illustrating that modern humans worked and walked the earth millions of years ago, even as far back as 2 billion years ago. The reverberations of this work on the scientific materialist hegemony warranted an extensive response, entitled Forbidden Archeology’s Impact, wherein Michael Cremo provided a blow-by-blow of his dealings with the fashion elite of the Darwinist persuasion. This is as important a book as the first two, but for different reasons. Forbidden Archeology‘s Impact reprints a multitude of negative reviews of the first book, followed by a reprint of a personal letter from Michael Cremo to each reviewer addressing the deceptive disclaimers therein with gracious but pointed sophistication. Cremo’s unruffled confidence in response to the openly boorish and arrogant comments of these defunct fur-covered die-hards is a wonder to behold. His professional finesse makes me feel a little ashamed of my joy in watching this pathetic group go extinct. In truth, the supremacy and authority of the Darwinists is in trouble. This slipshod paradigm doesn’t hold up to the scrutiny of those leading the emerging paradigm of mankind’s genesis. Cremo is one of those leaders. In his sequel, Human Devolution: A Vedic Alternative to Darwin’s Theory, Cremo suggests that human beings “did not evolve up from matter; instead we devolved, or came down, from the realm of pure consciousness, spirit.” Cremo sees “a new consciousness emerging that integrates science and religion into a cohesive paradigm of reality.” Yes, the emerging paradigm is a spiritual one, but it’s Universalist in scope. The Intelligent Design movement is not just comprised of Christians: atheists, new agers, conspiracy theorists, and yes, Hare Krishnas, have joined the ranks. After 150 years, Darwin’s theory is a flop and a diverse body of transcendent philosophies promises to undermine its authority. When NBC featured Forbidden Archeology in its 1996 program The Mysterious Origins of Man, hosted by Charlton Heston, establishment scientists lobbied the FCC to fine NBC for airing this opposing view! In this exclusive interview, Cremo discusses what he calls a “knowledge filter” upon which materialist science has based its dominant paradigm of human origins. 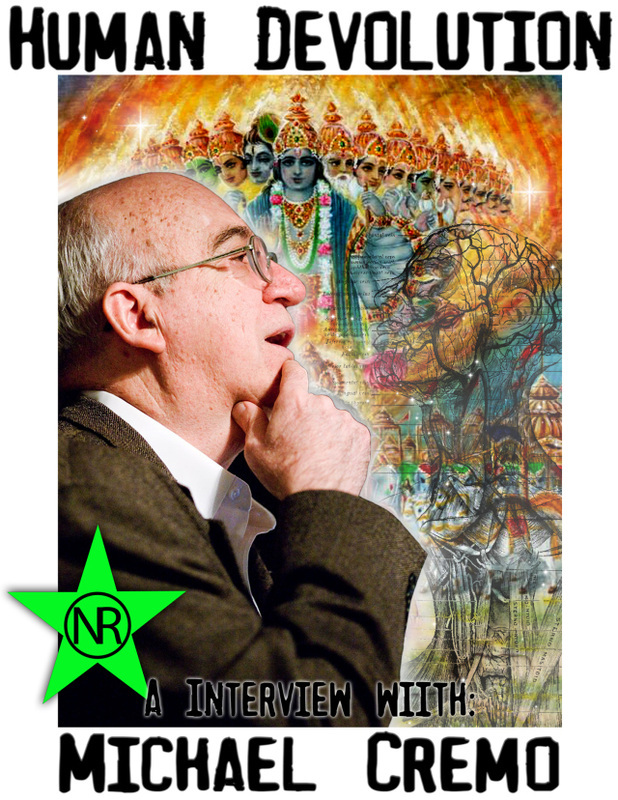 ​A research associate for the Bhaktivedanta Institute, Mr. Cremo’s anti-Darwinian thesis is embraced by both Christians and alternative epistemology advocates. His conclusions demand a paradigm change. Will it happen in our lifetime? Stranger things have happened. Stay tuned to BIPED for the latest. Michael, your books, Forbidden Archeology and Hidden History of the Human Race, co-written with Richard L. Thompson, presented the thesis that mankind is an exceedingly ancient race which was contemporaneous with the apelike creatures from which humans supposedly evolved. About how far back was your research able to document the human race? What is the oldest “anomaly” you reported in your book? Over the last few decades, miners in South Africa have been digging up mysterious metal spheres. Origin unknown, these spheres measure approximately an inch or so in diameter, and some are etched with three parallel grooves running around the equator. 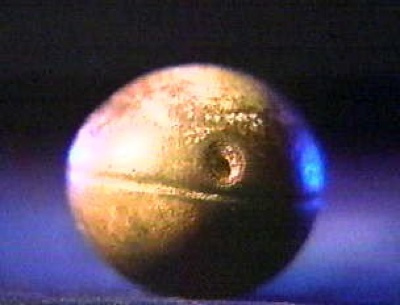 Two types of spheres have been found: one is composed of a solid bluish metal with flecks of white; the other is hollowed out and filled with a spongy white substance. The kicker is that the rock in which they where found is Precambrian – and dated to 2.8 billion years old! Who made them and for what purpose is unknown. The oldest artifacts go back about 2 billion years. These are round metallic objects that have been over the past couple of decades by miners in South Africa. The objects come from a mine near a place called Ottosdalin, in the West Transvaal region. The objects are one or two inches in diameter. The ones we had analyzed by metallurgists turned out to be made of an iron ore called hematite. The most interesting feature of the objects is the parallel grooves that go around the center of each one. Some have four grooves, some three, some two, some only one. The metallurgists who examined them said they were not produced naturally. Therefore, the objects must have been manufactured by someone with humanlike intelligence. Yet they are found solidly embedded in mineral deposits over 2 billion years old. You characterize Forbidden Archeology as an “archeology of archeology.” How so? I went digging into the history of archeology. From my studies in the ancient Sanskrit writings of India, I learned of a human presence that goes back about 2 billion years on earth. When I looked at the current textbooks on archeology, I did not see any such evidence. But I decided I would dig deeper, and when I did that digging I found that over the past 150 years archeologists have discovered huge amounts of evidence, in the form of human skeletal remains, human footprints, and human artifacts tens of millions, even hundreds of millions of years old, going all the way back to about 2 billion years. My digging took eight years, and it meant searching out original archeological reports in archives and libraries from around the world, in many different languages. Among the oldest anomalies you report are the Laetoli footprints, discovered by Mary Leakey. These footprints were found in Tanzania in 1979. How old are these footprints and what is so anomalous about them? Is there any other evidence for anatomically modern humans at this same time? The Laetoli footprints were found in layers of solidified volcanic ash, dated by the potassium-argon method as being about 3.7 million years old, so I would not call them one of the oldest. There are footprints and even shoe prints that go much further back in time than that. For example, the shoe print found by William Meister near Antelope Springs, Utah, goes back about 500 million years. The Laetoli footprints are still quite interesting. According to Mary Leakey, and other scientists, the footprints are exactly like those of modern human beings. This is unusual, because according to most scientists today, human beings capable of making these footprints did not come into existence until about 100,000 years ago. Mary Leakey did not believe, of course, that humans of our type existed 3.7 million years ago in Africa. So how did she explain the footprints? She and others proposed that there must have existed at that time some kind of hominid, some kind of ape-man, who had feet exactly like ours. That is possible. Unfortunately, there is no physical evidence to support that idea. We have many hominid skeletons from that period, and none of them have feet exactly like modern human feet. Their feet are all more or less apelike, with toes longer than modern human toes, and a first toe that can extend out to the side, like a human thumb. At present the only creature known to science with a foot exactly like that of a modern human being is a modern human being. So I would say that Mary Leakey discovered evidence that anatomically modern humans existed about 3.7 million years ago in Africa. Of course, someone might say that it would be better if we had anatomically modern human skeletons of that age. And such things do exist. For example, the Italian geologist Giuseppe Ragazzoni discovered anatomically modern human skeletal remains in Pliocene formations at a place called Castenedolo in northern Italy. The Pliocene goes from about 2 million years ago to 5 million years ago. And there are other such discoveries from other parts of the world. I’m particularly intrigued by the bola stones of Olduvai Gorge and Argentina. What do these stones tell us, that is, what were they used for and how are they incompatible with the current Darwinian paradigm of human evolution? Bola stones are stones that have been artificially rounded, and which many times also have a groove carved around the middle. The rounded, grooved stones are tied together with a thong, usually of leather. The result is the bola, a weapon that can be used to capture birds and animals. When thrown, the stone balls cause the thong to wrap tightly around the legs of the bird or animal, thus bringing it down. According to archeologists, bolas are a weapon made and used only by anatomically modern humans, humans of our kind. So Louis Leakey found bola stones in the lower levels of Olduvai Gorge, which go back to the Pliocene periods (2-5 million years). Leakey also found there a bone needle, which he believed was used for sewing leather. At Miramar, in Argentina, the Argentine archeologist Carlos Ameghino reported finding bola stones in undisturbed Pliocene formations, about 3 million years old. In the same layer, he also discovered the bone of an extinct South American mammal with a flint arrowhead embedded in it. Still later, another researcher found a partial human jaw in the same formation. According to the current Darwinian theory of human evolution, humans capable of making bola stones and arrowheads and bone needles did not exist until between 100,000 and 150,000 years ago. Homo habilis (the “handy man”) and Australopithecus afarensis (“Lucy”) are two “species” that turned out to be made up of the bones of two of more species. Yet there are still “mock ups” of these made-up species in museums. Is it widely accepted now that these species never existed, or are there some who insist these were viable intermediaries in the human lineage? There are some scientists who have reported that Homo habilis and Australopithecus afarensis were constructed from bones of two or more species, yet these hominids also do have their supporters. Despite the controversy, models of these hominids are in fact still displayed in many museums. These exhibits give no hint of the controversy that exists about these creatures in the scientific world. In this way, people are being misled. Of course, the museums also give no hint of the archeological evidence for extreme human antiquity, the evidence that shows that humans like us existed alongside our supposed ape-man ancestors, like Homo habilis and Australopithecus afarensis. The reaction you received from the scientific community when Forbidden Archeology was published was incredible enough to warrant the publication of your book, Forbidden Archeology’s Impact. How would you characterize the response? The response was varied, because the scientific community is not monolithic. There is one group within the scientific community that I call the fundamentalist Darwinists. These are scientists who take Darwinism as an ideology to be defended at all costs. They are attached to Darwinism for reasons that are not really scientific. Their reaction was to reject my work without really addressing any of the evidence. For example, Richard Leakey said Forbidden Archeology was “pure humbug.” But he did not discuss any of the facts. However, there are others within the scientific community who accept the Darwinist theory of human evolution for reasons that are more or less scientific. They are at least willing to hear alternative ideas and discuss evidence. From members of this group I have gotten invitations to speak at scientific institutions like the Royal Institution of London and the Russian Academy of Sciences, and at professional conferences organized by groups such as the World Archeological Congress and the European Association of Archeologists. Some of the papers I have presented at these conferences have been published in the official proceedings of these conferences. Scientists from this more open-minded group have also reviewed my books in the professional journals of archeology, anthropology and the history of science. For example, noted historian of science David Oldroyd and his coauthor Jo Wodak said about Forbidden Archeology in Social Studies of Science that the book makes a valuable contribution to the literature on paleoanthropology for two reasons. First, the book goes into the evidence in greater depth than any other book they were familiar with, and second, the book raised important questions about the nature of scientific truth claims, particularly in regard to human evolution. Among this more open-minded group, there are some scientists who have actually come to agree with my conclusions. Were you surprised by the reaction from the Darwinist camp? As I said, there are two kinds of Darwinists. The first is the fundamentalist type. I was not surprised by their sneering kind of negative reaction. I anticipated that, and indeed, I used some of their more strident statements to get more attention for my work, both within the scientific world and among the general public. I was rather pleasantly surprised by the willingness of the more open-minded Darwinists to give me platforms to present my views at scientific societies, scientific conferences, and science departments at universities around the world. I was also pleasantly surprised by the amount of attention they gave to my work in book reviews in their professional literature. What was the general reaction of Christian fundamentalists? I anticipated that I would be able to find some common ground with them, and that did turn out to be the case. I believe that scientists and other intellectuals are, at this point in history, at a major juncture. We are in the midst of what I call a renegotiation of our whole picture of life and the universe, something that happens once every few centuries. And there are many parties to this renegotiation, among them mainstream scientists, but also alternative science people, New agers, religionists of various kinds, and others. So I try to stay in touch with all of these different parties and not get boxed into just one particular audience. Your books are overall well accepted by young-earth Christian fundamentalists. Yet, your message is the opposite, that the origin of the human race is exceedingly ancient. What is the common ground between your ideas and those of others in the Intelligent Design movement? As far as the young earth creationists are concerned, I tell them that whether we believe the earth is a few thousand years old (as they assert) or a few billion years old (as I assert), humans like us have been around since the beginning of the history of life and we did not come from more primitive apelike ancestors. On that basis we are able to find some common ground. The intelligent design theorists are a newer phenomenon. They include such people as Phillip Johnson, biochemist Michael Behe, and philosopher of science William Dembski. Although they do embrace Christianity, they keep the Bible and any direct mention of God in the background of their scientific work, stressing evidence for the more general concept of intelligent design. They are not necessarily supporters of a young earth. In fact, it seems that most of them are not. My work offers some support for their views. We agree that human beings and other things display a level of biological complexity on the molecular level that has not been explained by Darwinists. So we do have something in common, although I’m more up front with my Vedic commitments. You state that the purpose of Forbidden Archeology was to confront evolutionists with an “accumulation of crucial anomalies” and to provoke a paradigm crisis in science. Do you think you’ve accomplished your goal? I’m not the only person challenging the now dominant Darwinian theory of evolution. That doctrine is now under sustained attack from many directions. We should also keep in mind that most people in the world, including most Americans, don’t really accept the theory. I don’t think that this is a situation that can long continue. So I would say yes, supporters of the Darwinist paradigm now are in the beginning stages of a major crisis, as can be judged from the volume of the howls of protest coming from them. I think I’m doing my part to keep the heat on them. One reviewer wrote, “Today the creationists deliver the provoking news. Previously this was the function of the evolutionists.” Do you see the Intelligent Design movement as this provocation? That was written by Danish scholar of religion Mikael Rothstein, in a review of Forbidden Archeology for the Copenhagen newspaper Politiken in 1994. Of course, I agree with him. I believe that the intelligent design movement is part of the coalition of forces that are provoking a reaction to the current consensus in mainstream science. But that coalition also includes various kinds of creationists, New Age authors, researchers in parapsychology, UFOs, and paranormal healing, and a variety of others. I have met some of the leading intelligent design theorists. For example, Phillip E. Johnson, author of Darwin on Trial, wrote a foreword for The Hidden History of the Human Race. Michael Behe, author of Darwin’s Black Box, and I have met a few times, and we do have a common cause. However, my Forbidden Archeology coauthor, Richard Thompson, and I were speaking about the irreducibility of complex biological form and the need for intelligent design to account for it way back in 1984, before any of the current crop of intelligent design theorists were doing so. Has the movement accepted you in its ranks? Sort of, but I differ from the intelligent design theorists in some respects. For example, most of them appear, along with the Darwinists, to accept that humans and other living things are simply complex forms of matter. The only difference between the Darwinists and the intelligent design theorists is how the complexity came to be. The Darwinists attribute the complexity to evolution by natural selection, whereas the intelligent design theorists attribute it to intelligent design. I disagree with the assumption, shared by Darwinists and intelligent design theorists, that humans and other things are simply complex arrangements of ordinary matter. I believe that there are good reasons to suppose that humans and other living things are combinations of three things: ordinary matter, a subtle mind element, and an element of pure consciousness or spirit. I think a better clarification is that Darwinists (naturalists) say that intelligence cannot have been there in the first place and had to evolve, whereas ID theorists say intelligence was always there in the system and it came first and gave rise to everything else. That is a good clarification. The intelligence itself is the assumed designer, and whatever word you want to use to describe that is up to you. God or Goddess is OK with some. The concept of Mind-at-Large might be more acceptable to others. So in a way this is not that different from what you are saying, or is it? As far as it goes, it’s not different. But I do go further than that. We’re getting caught up in terminology that is difficult to grasp. When ID theorists talk about “intelligence” they are talking about a designer, pure and simple. Design means the same thing as create, doesn’t it? In this context, I think most people will take them as closely related, if not the same. I think the real difference is that you are more specific about what humans are made of: matter, mind and spirit (pure consciousness) and you are more “up front” about being a “Krishna creationist,” as you have been called. The others perhaps want to distance themselves a bit from their religious views so they can attempt to get a more fair hearing. I can’t say I blame them. I don’t blame them either. But I have been to intelligent design conferences where I have seen them put on the spot, being pressed to identify the “designer.” At this point, most of the prominent intelligent design theorists are Christian. Their opponents are not unaware of this and make an issue of it. “So what is this designer. Are you speaking about a UFO alien?” So I prefer to just take that issue off the table by stating up front what my personal bias is. If that is actually true, that’s fine. I did this so people wouldn’t immediately switch channels, thinking they had fallen onto some (god forbid) “creationist” website! On my forbidden archeology website, I don’t put it up in red lights that I’m a “Krishna creationist.” But neither do I hide it. That way, no one can accuse me of some hidden agenda. That can be distracting from the scientific issues. Are you in a way holding it against them for not being as forthcoming as you regarding their religious views? No, I don’t hold it against them. They are doing things the way they want to do it, and they have their reasons. They just want to focus on evidence for design, and that is fine. As I said, I have been speaking about intelligent design and irreducible complexity since 1984, before most of them were doing it. It’s definitely part of my program, but I have added some other elements, by being more up front about my conception of the designer and by introducing new elements into the discussion: mind and consciousness. Another thing is I really don’t accept the distinction many try to make between science and religion. I don’t see myself as either scientist or religionist. I see myself as a human being seeking the truth, and I’m prepared to accept whatever it’s that helps me get at the truth, call it science or religion. One comment by a skeptic was that your book is “a well-written example of pseudoscience, it looks like the real thing.” This skeptic said you should have aired your arguments through professional journals. In your estimation, would you have been allowed a foot in a “professional journal” with this material? “Michael Cremo, a research associate in history and philosophy of science, and Richard Thompson, a mathematician, challenge the dominant views of human origins and antiquity. This volume combines a vast amount of both accepted and controversial evidence from the archeological record with sociological, philosophical, and historical critiques of the scientific method to challenge existing views and expose the suppression of information concerning history and human origins.” Journal of Field Archeology, Vol. 21, 1994, p. 112. “I have no doubt that there will be some who will read this book and profit from it. Certainly it provides the historian of archeology with a useful compendium of case studies in the history and sociology of scientific knowledge, which can be used to foster debate within archaeology about how to describe the epistemology of one’s discipline.” Tim Murray, in British Journal for the History of Science, Vol. 28, 1995, p. 379. “It must be acknowledged that Forbidden Archeology brings to attention many interesting issues that have not received much consideration from historians; and the authors’ detailed examination of the early literature is certainly stimulating and raises questions of considerable interest, both historically and from the perspective of practitioners of sociology of scientific knowledge.” Jo Wodak and David Oldroyd, in Social Studies of Science, Vol. 26(1), 1996, p. 196. This is not to say that these reviewers agreed with all my conclusions. But the point is that I did air my arguments through the professional journals, although not exactly in the way that the skeptic insisted. Basically, I did the same thing Darwin did. He did not air all of his arguments in a piecemeal way through the professional journals. He spent twenty years working on his book Origin of Species, and then he just unleashed that book on the general public and the scientific world. You have described neo-Darwinism as “an ongoing social process of knowledge filtration” that has a cumulative effect. But when you talk about suppression of evidence for extreme human antiquity, you are not talking about a grand conspiracy. How would you then characterize this “knowledge filter”? Earlier this year, I gave a talk to the department of anthropology of the Russian Academy of Sciences in Moscow. After I spoke, one of the anthropologists was quite upset with me for talking about the knowledge filtering process. She said, “We are honest people.” But then she also said, “I have not read your book, but I’m sure that everything in it must be either a mistake or a hoax. There is not any evidence that actually contradicts our evolutionary picture of human origins.” So she denied the knowledge filtering process but at the same time provided a perfect example of it, letting her theoretical preconceptions govern how she treated the evidence. Yes, this is probably a very common reaction among those hoodwinked by Darwinist propaganda. Another common reaction from a “skeptic,” in Forbidden Archeology’s Impact, was that you have “abandoned the testing of simpler hypotheses before more complex and sensationalistic ones.” It seems to me that what makes something “simple” is the prior belief in it. Yet, this “economy” argument is used quite frequently by “skeptics” who feel that Darwinian evolution is so obvious as to be unquestionable. How do you address this argument? When the simplicity argument comes up, as in the case you mentioned, the skeptic assumes that the Darwinian explanation is the simplest one, whereas an explanation involving creation or intelligent design is the more complicated one. First of all, I cannot think of a single instance in which I have not given consideration to the Darwinist interpretation of the evidence. Second, the Darwinian explanation is not so simple. If we look at the neo-Darwinian synthesis, we see that it involves quite a complex interaction of genetics, developmental biology, population dynamics, and fitness in specified environments. Actually, it’s so complex that Darwinists are unable to actually explain the origin of the anatomically modern human species in the terms their own theory requires. For example, if they want to explain the human eye, they would have to specify the genome of some ancestral animal that did not have an eye. Then they would have to specify a change in the genome of that animal that would result in the first step in the formation of the modern human eye. Let’s keep in mind that a gene just tells a cell how to make a specific protein from amino acid subparts. So they should be able to tell us what protein the mutated gene would produce. We also have to keep in mind that this protein would have to have an effect in the course of the development of the organism, starting from the egg. So they should be able to specify how the biochemical pathway by which this protein would have some effect, way downstream in the cell division process, perhaps after tens of thousands of cell divisions, so that the first part of the eye is produced in the organism. Then they would have to explain how this change in the gene, etc., would become spread throughout and fixed in a breeding population. They would have to explain how this change would contribute to the fitness of the individuals in that population in a specific environment. Then they would have to iterate this process, to explain the next step in the production of the eye. Keep in mind, we are not just talking about the structure of the eye. There would have to be an optic nerve that could carry signals to the brain. The eye would also have to have sets of muscles to control it, and these would require nerves going to the brain, and the brain itself would have to have a neuronal structure capable of processing the signals from the eye. The development of each of these subsystems would have to be specified in exactly the same way as described above. You will find no such explanation in any biology text or scientific journal. So it might be debatable as to what the “simpler” hypothesis really is. Ultimately, there is no guarantee that the simplest hypothesis is the true one. Michael, I noted on the Internet that you were born in Schenectady, NY, in 1948, and you received your first copy of the Bhagavad-Gita from some Hare Krishnas at a Grateful Dead concert. You later joined the group and began writing for the Bhaktivedanta Book Trust at ISKCON (International Society for Krishna Consciousness). What prompted you to initially become involved in what I might call your “Darwin Project”? In 1984, the Bhaktivedanta Book Trust asked me to work with one of the Hare Krishna movement’s scientists, Richard Thompson, to produce for the general public a statement of our positions on various scientific questions, including the Darwinian theory of evolution. I would like to discuss the paradigm you have offered in your new book, Human Devolution. In your opinion, how solid is the fossil evidence that H. sapiens pre-dates (precedes) H. erectus or that the two co-existed? The evidence is quite solid – as solid as any other archeological evidence – but it’s not well known because of the process of knowledge filtration that operates in archeology. Evidence that conforms to the current evolutionary consensus passes through this filter; evidence that radically contradicts it does not. The truth is that over the past 150 years, archeologists and other earth scientists have discovered hundreds of anatomically modern human skeletal remains, anatomically modern human footprints, and artifacts normally attributed to anatomically modern humans. Is there evidence that H. erectus was an intelligent ape? The taxon H. erectus is quite diverse, and many archeologists and anthropologists have split it up into several species, such as H. ergaster and H. heidelbergensis, in addition to H. erectus. Some of the skeletal remains look more modern, some look more apelike. You state that human-like and ape-like beings co-existed on Earth for hundreds of millions of years. In the Hindu artwork we see humans pictured with what appear to be intelligent apes or monkeys. What was the relationship between these monkeys and humans in the Hindu accounts? Do you think this artwork might depict reality at a certain time in prehistory? Yes, it does reflect a reality. The idea of ape-men is not something that was invented by Darwinists of the nineteenth century. Long before that, the ancient Sanskrit writings were speaking of creatures with apelike bodies, humanlike intelligence, and a low level of material culture. For example, theRamayana speaks of the Vanaras, a species of apelike men that existed millions of years ago. But alongside these ape-men existed humans of our type. The relationship was one of coexistence rather than evolution. In your new book, please explain how you account for the “non-evolutionary relationship” between australopithecines and modern humans. The Vedic writings speak of 400,000 humanlike species scattered throughout the universe. In my opinion, anatomically modern humans and the various hominids, such as the australopithecines, could be placed among those 400,000 species. All of these species, and all of the other plant and animal species, were designed as vehicles for conscious selves. Today, we see that auto manufacturers design and build many different kinds of vehicles of different types and sizes and prices for people of different tastes, needs, and purchasing power. So the “intelligent designer” does the same thing: designs and builds various kinds of bodies for conscious selves with different desires and karmas. How does the age of the earth and the existence of life on it correspond to the Hindu cosmological calendar? Where are we now in the Hindu calendar? The Hindu, or Vedic, concept of time is cyclical. There are cycles within cycles within cycles. The basic unit of this cyclical time is called the day of Brahma. It lasts about 4.3 billion years. It’s followed by a night of Brahma, which also lasts about 4.3 billion years. The days follow the nights endlessly in succession. During the days, life is manifested in the universe, and during the nights it’s dormant. The current day of Brahma, the one we are in now, began about 2 billion years ago. So by this account, we should expect to see signs of life, including human life, going back about 2 billion years on earth. In fact, that is what we do see, as documented in Forbidden Archeology. It’s interesting that the oldest undisputed fossil evidence for life on earth recognized by paleontologists is also about 2 billion years old. We’re talking about the oldest undisputed fossils of single celled life forms. Some scientists believe they can detect chemical signs of life going back further, but that kind of evidence can be questioned. So there does appear to be a parallel between the Vedic cosmological calendar and the findings of modern paleontology, with both indicating the first presence of life on earth about 2 billion years ago. Modern geologists give the earth an age of about 6 billion years. I think there is also a Vedic parallel here as well. First, we have to keep in mind that the Vedic conception of the universe is that it’s pretty much like a virtual reality system, giving the conscious self a temporary domain of experience, apart from the eternal domain of the realm of pure consciousness, or spirit. Under this conception, I picture the earth, our particular domain of experience, as being somewhat like a rewritable CD or DVD disk. It’s erased at the end of each day of Brahma. All the geological and paleontological evidence that was written on the disc. Then comes a night of Brahma, during which the disk is reprogrammed. Geological information is written on the disk. The night of Brahma lasts 4.3 billion years. Then comes the next day of Brahma. And then biological evidence starts to get written on the disk. And we are now 2 billion years into the day of Brahma. So when we look at the evidence, we find geological evidence that the earth has existed for about 6 billion years, and biological evidence, in the form of fossils, showing that life has existed for about 2 billion years. This is an interesting parallel between the Vedic and modern scientific accounts. Also, the day of Brahma is divided into 14 subcycles called manvantara periods, each lasting about 300 million years. Between each one there is a devastation, after which the earth has to be repopulated. We are now in the seventh manvantara cycle, and that means there have been six devastations over the past 2 billion years. Modern paleontology also tells us that the history of life on earth has been interrupted by six major extinction events, spaced at intervals of hundreds of millions of years, the last being the one that wiped out the dinosaurs about 65 million years ago. What happens during the “night of Brahma” when the earth is “unmanifest”? The various living entities are put into a state of dormancy or suspended animation, something like dreamless sleep. In Hindu cosmology the world is created and destroyed and recreated how many times? Endlessly. We have been speaking of days and nights of Brahma. One day and one night add up to a complete day of Brahma. There are 360 such days in a year of Brahma, and Brahma lives for 100 of such years, or 36,000 days. Each life of Brahma corresponds to one breath of Maha Vishnu, who lies in the Causal Ocean. That works out to about 311 trillion years. We are now about halfway through the life of the present Brahma in our universe. When the Maha Vishnu breathes out, millions of universes come into being, at first in tiny seed-like form, then in a burst of light, each universe begins to expand. And in each universe, a Brahma comes into being and fills that universe with living entities. And when the Maha Vishnu inhales, then the universes contract and go back into the Maha Vishnu. Again, there are many parallels with modern cosmology. Many universes. Expanding universes. Contracting universes. This corresponds to Velikovsky’s idea that there have been “many Adams.” How many times has the world been created and destroyed? If energy can never be destroyed, would you say then that it just moves into a different dimension and becomes “unmanifest”? Yes, something like that. There is something in Vedic cosmology called pradhana, which is the unmanifest, undifferentiated material energy. During the creation cycles, this unmanifest material energy becomes differentiated into elements, starting with the more subtle elements and proceeding to the grosser elements. Then the differentiated elements are manifested into the forms of planets and bodies, which serve as domains and vehicles, respectively, for conscious selves. You write that the true ancient Hindu cosmology was “dismantled” by Europeans in order to bring it into line with the biblical time scale. When was this done? Yes, this happened during the 18th and 19th centuries. They tried to fit everything within five thousand years. So how ancient then is mankind according to Hindu cosmology? In the current day of Brahma, humankind goes back 2 billion years. In each day of Brahma, in each life of Brahma, not only in this universe, but in countless other universes, the human form has been manifest for vast periods of time. Keep in mind that the human body is a vehicle for a conscious self, and the proper use of the vehicle is to bring the conscious self back to its original position in a realm of pure consciousness, where spiritual human forms have always existed beyond time. That is our original home. When we depart from there, the conscious self is covered by a material form, a body. That covering process is what I call devolution. But the process can be reversed, and the conscious self can be freed of its coverings and restored to its original pure state. That process I call re-evolution. Every genuine wisdom tradition in the world has some means for accomplishing that, some method of prayer or meditation or yoga. So I encourage people to look deeply into their traditions and take advantage of the revolutionary techniques that are there. Of course, what I’m talking about here goes beyond the externalities that most people identify with religion. ​He states that history is in a “lamentable condition” since humankind has probably been here more like “a hundred million years” and less than 5,000 years is being documented by mainstream science. Hall presumes since nature is “profoundly economical,” this human memory is accessible somehow. Does this tie in to your concept of re-evolution? Without having read the book, it’s hard for me to say how much his ideas really do match up with mine. But on the basis of what you have picked out, I do see some parallels. The idea of extreme human antiquity is something we have in common. The idea that we have forgotten some original state of consciousness is also a common theme. Your concept of “re-evolution” requires a deep commitment to meditation? Are you speaking of attempting to go beyond present individual memory to a deeper and collective human memory? It depends on how you conceive of this collective human memory. I do believe that we are all originally from the same place. But our (now lost) memory of that higher dimensional spiritual homeland is common, not collective. In some of the old Star Trek shows, we heard about being plugged into the Borg collective – “resistance is futile.” I do not accept that we belong to that kind of collective, and that our individual existence is kind of an illusion. Say for example, we have a group of expatriate Americans meeting in some far off place in the world, in Ulan Bator in Mongolia, for example. And we meet in a restaurant there. So we will all have our memories of America. But those are individual memories that we have in common, not collective memories. We are individuals. We have individual memories. But those memories do have something in common. You talk about the present time as being an important juncture in the renegotiation of our picture of life. I think that essentially we’re sick of being lied to and some of us are demanding a major correction to the textbooks. Would you agree? Yes. The view that is presented in the textbooks is a strictly materialistic view, which involves a Darwinian evolutionary conception. But if you look at Gallup surveys of the actual beliefs of the American people, you will find that most people do not accept the Darwinian theory of evolution and its underlying materialistic ontology. About 45 percent believe that God created human beings in the beginning. Now these same people may have some pretty sectarian religious views, which I would not endorse, but I think they do have it right on the question of evolution. An additional 37 percent of the American people believe that God created human beings but He did it by evolution, while only about 12 percent accept the theory of evolution as it is put forward in the textbooks, as a random natural process. So clearly the vast majority of the American people do not accept the theory of evolution as it’s taught in the textbooks. Gallup surveys also show that most of the American people accept things that contradict the materialistic worldview that underlies the evolution theory. For example, about half of the American people accept extrasensory perception (ESP). And such beliefs are not confined to the people in general. They have also infected the scientific community itself. In various parts of the world, scientists are forming alternative science organizations to investigate phenomena that are out of bounds in mainstream institutions. Here in the US we have the Institute for Noetic Sciences, founded by astronaut Edgar Mitchell, and in the UK the Scientific and Medical Network. So this is a situation that is not very stable. The majority of people and many in the scientific community are opposed to what is being forced upon us in the textbooks by a now dominant elite. What would you like the textbooks to say in the future about the genesis of humanity on Earth? In the immediate future, I would like the textbooks to present alternative views of human origins. Let them present the Darwinian theory of evolution, but let them also present alternative ideas, such as intelligent design theory and devolution. I think the extraterrestrial theory also deserves mention. These alternative ideas should not be presented in a derogatory way, but in a neutral way, and students should be invited to make up their own minds about the question. I think that if this is done, eventually, the Darwinian theory is going to find itself in the place of an “alternative” idea. I do not think it will ever disappear, but it will assume a lesser status. In my personal experience I have noted that children in junior and senior high schools are pretty much bought and sold on the Darwinian paradigm. What would you suppose to be the first steps toward opening their minds to other views? My experience is actually somewhat different. I find lots of children in their teens who are very open to new ideas and who are not sold on Darwinism at all. But for the others, I would say the first step is to allow alternatives to be presented in the classrooms and textbooks. But then, sometimes I think maybe it’s best to keep the alternatives as kind of dangerous underground ideas, and let them circulate outside the normal channels. That might make them really attractive. But I suppose (sigh) that eventually I would want to see alternative ideas making their way into the regular classrooms and textbooks. Perhaps as a first step our textbooks should be more realistic and honest about what we know and don’t know, rather than presenting a metaphysical theory as a scientific fact. Oh yes. It would also be helpful if they presented a more accurate picture of the history of science. For example, every physics textbook mentions Pierre and Marie Curie, who got Nobel Prizes for their work in discovering radium. Why not also mention that they were heavily involved in psychical research? Why not mention the current research going on under the auspices of the Princeton Engineering Anomalies Research Group, showing that mental intention can cause random number generators to produce more zeros than ones in a string? I was wondering what your thoughts are on the anthropic principle. I’ve given it a lot of thought and I believe it’s bogus. It’s a huge part of the materialist mindset, the idea that intelligence has got to evolve and cannot have been “in the system” so to speak from the beginning. I notice that you discuss it in Human Devolution specifically as it regards the fine-tuning specifications of the universe. Can you explain your position? The fine-tuning problem is a problem that requires an explanation. The problem is that particular values for various fundamental physical constants and ratios of forces appear to be entirely arbitrary. If they were even slightly different, we would not have atoms, planets, stars, or life forms. It would appear that the values have been selected by a designer. To get around that, the anthropic principle proposes we should not be surprised to find ourselves in a universe where everything is fine-tuned. If it were not like that, we would not be here. But this still begs the question as to why this universe is fine-tuned. It still could be because there is an intelligent designer. To avoid that unwanted conclusion, some propose brute chance. It just is that way. That is not very satisfying, so they propose many universes, each with different values for the constants and ratios, and we just happen to have won the lottery, so to speak. We are in the one where everything is properly fine-tuned. But this idea assumes that there are in fact other universes, and that all the other universes, or a good many of them, are lifeless and have the fundamental constants and ratios adjusted in a different way. But there is no evidence for this. What if, for example, there are in fact other universes, but they are all fine-tuned so that life can and does exist in them. There is no way for them to rule that out. So, I accept that the fine-tuning problem is a sign of design. I accept the general principle that we should not be surprised to find ourselves in a universe where everything in fine-tuned. But this still leaves open the question how it got fine-tuned. It could be design. But some supporters of the anthropic principle, in an effort to avoid intelligent design, jump to a many worlds proposal, with the fine-tunings different in each one, and we just happen to find ourselves in the right one. But there is no proof of that. There could indeed be many universes, and in all of them the fine-tuning is there and life is there, because an intelligent designer made all of them that way. Indeed, that is what the Vedic cosmology teaches. As far as the one universe we can see is concerned, it appears to be designed. The many worlds version of the anthropic principle doesn’t really allow us to avoid that conclusion. The fine-tuning problem is the cosmological component of the anthropic principle, but it also contains a biological aspect: the minimum time required for the evolution of “intelligent observers.” Frank Tipler’s enunciation of it, in The Anthropic Cosmological Principle, requires a billion years for the Darwinian evolutionary process to produce intelligent beings from non-living matter. The term “intelligence” is implied to mean only “human intelligence.” It’s, of course, closely allied to an Earth-centered paradigm that insists we climbed out of the muck of our local habitat, that we are a localized, one-of-a-kind anomaly that “acquired” consciousness along the way. In that sense, I refer to Darwinian evolution as “Western man’s totem.” What are your thoughts on this aspect of the anthropic principle? I disagree with Tipler’s idea that intelligence comes only after billions of years. It’s there in the beginning. It has always been there. Michael Cremo is the co-author of Forbidden Archeology: The Hidden History of the Human Race(1993) (also on audio cassette) and The Hidden History of the Human Race (Condensed Edition) (1999). He is the author of Forbidden Archeology’s Impact: How a Controversial New Book Shocked the Scientific Community and Became an Underground Classic (1998) and Human Devolution: A Vedic Alternative to Darwin’s Theory (2003), all published by Torchlight. He is also the co-author with Mukunda Dasa Goswami of Divine Nature: A Spiritual Perspective on the Environmental Crisis (1995), published by the Bhaktivedanta Book Trust. Interview conducted by Joan d’Arc reprinted from B.I.P.E.D. Order Michael Cremo’s Forbidden Archeology: The Hidden History of the Human Race, Human Devolution: A Vedic Alternative to Darwin’s Theory and Forbidden Archeology’s Impact from our Open Revolt store and show support for our Revolutionary work!